Strong legs and effective movement are the keys to getting square to a shooter as quickly as you can. In this video, we explore a few variations on a couple of simple drills that will allow you to get in a great workout in a short session. Short, but frequent workouts will help you build strength and speed as you perfect your technique. 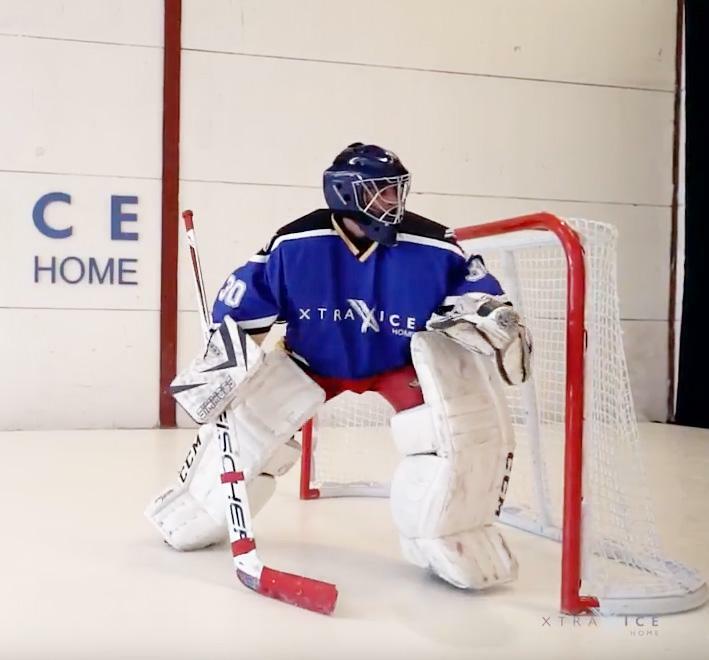 Let’s start using a simple triangle as a way to practice moving in both directions around the crease. The triangle consists of 3 points; the left post, the right post and the center at the top of the goal crease. From the right post to the center and return to the same post. From the right post to the center and then to the left post. Drop to butterfly each time you come to the center position. Get back up to your feet quickly and continue. Move from one post to the other, looking behind the net and then move back to the center as if tracking a pass from behind the net and drop to the butterfly to stop an oncoming shot from the slot. Shuffle into the T push. If you have a shooter, add a shot each time you come to center in the butterfly. Now, let’s add a couple of pucks to the two posts to make a square and complicate things a bit more. This drill is great for moving around the crease quickly while tracking the puck. Start with a simple T push to each of the 4 positions in order. Now go from the right post to the near puck and back to the post. Then right post to the far puck and back to the right post to complete the set. Now change directions, starting from the left post. Go from the post to the near puck. Move to the far puck for a shot. You should do this in both directions. Remember to use your imagination to track the puck as it moves around the zone so that your head is leading your body. In 20 minutes you can get in a great workout that will have a noticeable effect on your game.